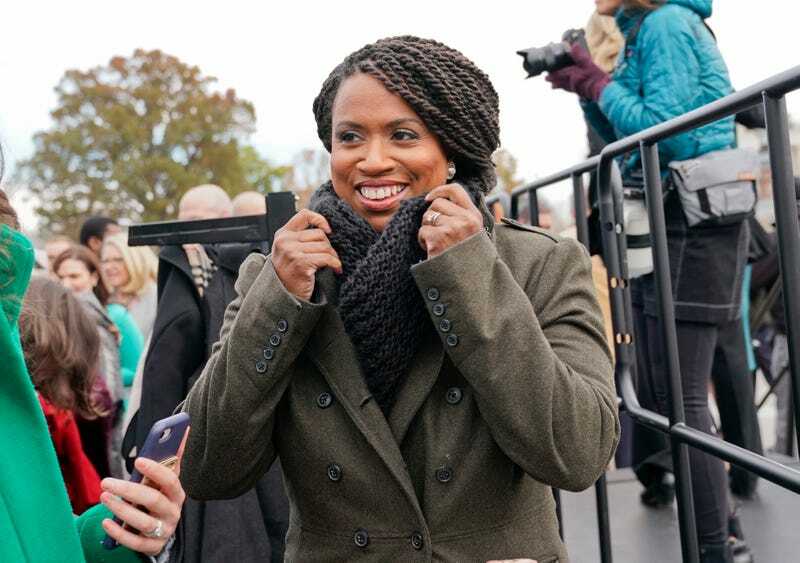 Joined by workers, survivors, and advocates from across the country, Rep. Ayanna Pressley (D-MA) and other congressional Democrats have introduced new, comprehensive legislation that tackles harassment in the workplace. The multifaceted “Be HEARD Act” is aimed at bolstering protections for workers, particularly those in lower wage and entry-level jobs where employees tend to be most vulnerable. The bill was authored by Rep. Pressley and four other Democrats, all women: Senator Patty Murray (D-WA), Congresswoman Katherine Clark (D-MA), Congresswoman Elissa Slotkin (D-MI), and Congresswoman Debbie Mucarsel-Powell (D-FL). Introducing the bill on Capitol Hill Tuesday morning, Pressley recalled the people who inspired her to help draft the legislation. The Be HEARD in the Workplace Act stands for “Bringing an End to Harassment by Enhancing Accountability and Rejecting Discrimination,” and includes a sweeping array of proposals. This includes provisions that workplaces adapt formal strategies to prevent harassment (including nondiscrimination policies and trainings). The bill also clarifies protections for LGBTQ workers, eliminates the tipped minimum wage, and strikes the caps on compensatory and punitive damages workers win when they file harassment suits against their employers. “From Hollywood, to Congress, to board rooms, restaurants, manufacturing floors, and farm fields, workers are making clear these experiences won’t be swept under the rug any longer,” the summary read. Building on existing civil rights and anti-discrimination protections, Be HEARD keeps a particular eye toward expanding protections for workers, particularly those in lower-wage jobs. Among the most notable changes is striking down the tipped minimum wage, a different wage tier for workers like bartenders and restaurant servers who make a substantial amount of money based off tips. The current federal tipped minimum wage stands at just $2.13 an hour. The current tiered system exacerbates harassment, the bill’s authors say. That’s supported by some recent research that found abolishing the tipped minimum wage and implementing fair pay would enable women to stand up to abuse and sexual harassment in their workplaces. Pressley drew upon her own experiences as a hotel worker when speaking about the bill. The Be HEARD act also expands current protections to include workers at small businesses, independent contractors, interns, fellows, volunteers and trainees, and makes it easier for workers to file harassment claims in court. But there will be resources for employers as well: the bill promises resources to help employers in preventing harassment. Model policies and training, industry-specific best practices, and model workplace climate surveys will be made available, and the bill currently includes a provision to support ongoing research and data collection on workplace harassment nationwide. Pressley and the bill’s authors also had one final message for sexual harassers and abusers. Updated: Wednesday, 4/10/19 at 2:16 pm, EDT: TIME’S UP, the organization launched in 2018 in the wake of the first #MeToo allegations, has released a statement throwing public support behind the Be Heard act. “Thanks to the powerful testimony of women across the globe who raised their voices and bravely shared their #MeToo stories, we are in the midst of a long-overdue cultural upheaval. TIME’S UP is proud to support the Be HEARD Act, which will help ensure that meaningful, lasting change is enacted to protect women at work,” wrote Jen Klein, chief strategy and police officer for TIME’s UP.